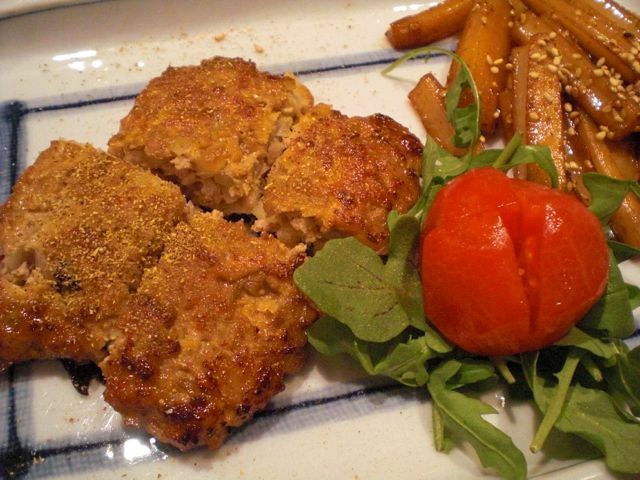 I posted two versions of chicken patties or “tsukune” before. There are many variations to the recipe. Some put egg, grated nagaimo or yamaimo, chopped up chicken cartilage, shiitake mushroom etc. We do not particulary like having bits of cartilage in the meat. Instead, to add an interesting texture contrast, I added finely chopped lotus root or renkon 蓮根. The renkon bits do give some crunch but not like cartilage or bone bits. Tsukune mixture: I hand chopped to make ground chicken from thighs (2 large) but of course you could just buy ground chicken or use a food processor. I like to use thigh meat with a bit of fat. I mixed in finely chopped onion (1/2 small), ground ginger (1/4 tsp), sliced and chopped lotus root (1/4 of vacuum packed pre-boiled), yuzu-kosho (1/2 tbs or more). As I mentioned, one could add more ingredients such as ground nagaimo or yamaimo, tofu, beaten egg etc. Using the same mixture I cooked it in two ways. In the first version, I spread the meat mixture on the square (1/4 of full nori sheet) of nori and fried it–meat side first and then nori-side. Dishes with nori involved often include a word “seashore” or “Isobe” 磯辺. 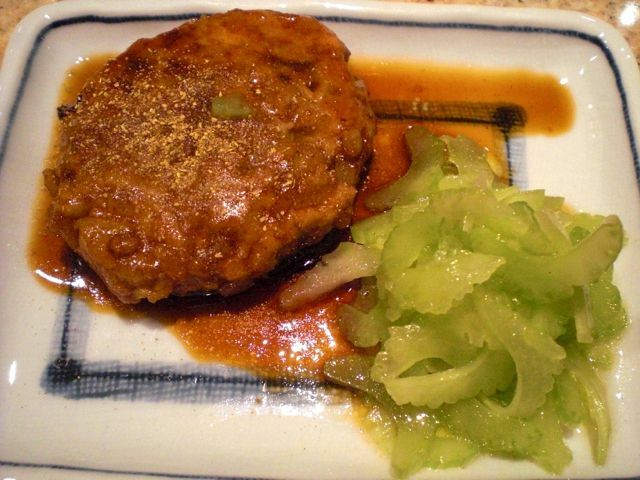 So this is “Isobe” grilled chicken patty. I made an equal mixture of mirin and soy sauce and added it to the pan towards the end of cooking and coated the chicken patties. After removing the patties from the pan, I further reduced the sauce until it was rather thick and put back the patties to coat. I sprinkled Japanese “sansho” 山椒 powder. I served this with “kinpira” or braised lotus root (This was made from the remaining lotus root, a subject for another post). I should have taken pictures with this dish turned over to show the piece of nori. The next day using the same mixture, I made the tuskune in the regular way (pan fried and then braised in mirin and soy sauce) and served it with celery salad with powdered kelp or “kobucha” 昆布茶 and olive oil. The Addition of lotus root and yuzu-kosho made this tsukune pretty good. I like grilled yakitori style tsukue best but when you cannot grill, pan frying like this is also excellent.